I was talking to one of the guests who summed up the evening perfectly, “it’s just nice to sit outside and talk with friends.” Simple truth. 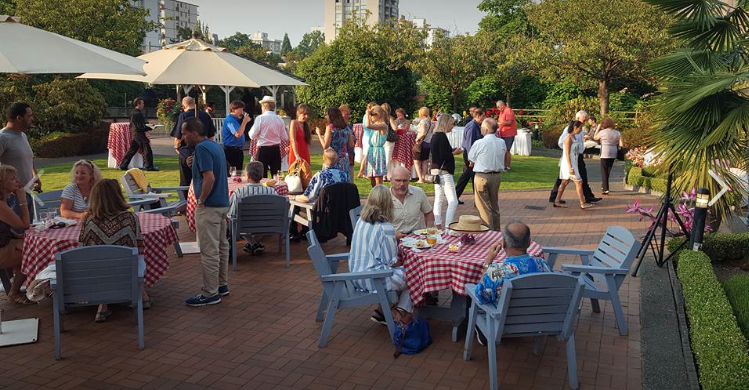 It was an effortlessly beautiful summer evening on the lovely Garden Terrace at The Coast Plaza. Thank you to Suzanne Bidinost and Joni Gilmurray at Coast Hotels for all you did to ensure fast service and a well-orchestrated event. Merci Beaucoup to all the Coast Plaza staff who were genuinely happy to be there, it showed, and you added greatly to the fun and flavour. Muchas gracias to the talented Locura Trio for infusing the evening with your dreamy Latin Jazz sounds and adding to the laid back classy vibe. Congratulations to our door prize winners: Judy winning a $25 Gift Certificate to Preston’s Restaurant & Lounge, Jennifer winning a $50 Gift Certificate to Comox Bar & Grill, Anita winning a Gift Basket from Vancouver Suntan & Wellness Centre worth over $160! 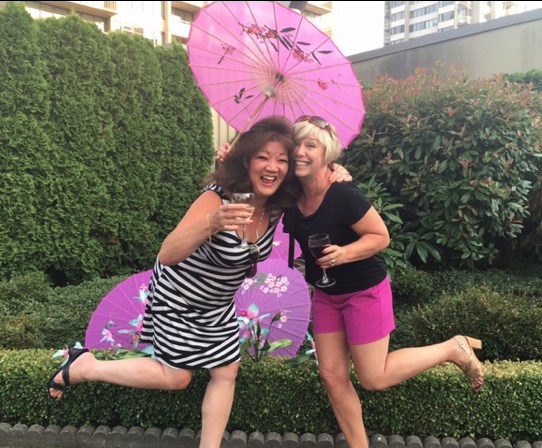 And our grand prize winner, Tracey who won a 1 Night Stay at The Coast Plaza including breakfast for two at The Brassiere and complimentary parking! Thank you to everyone who sent me photos and video – I’ve uploaded them to our Minglers Facebook page here.